Traditional Greek eatery with a lively, inviting atmosphere. 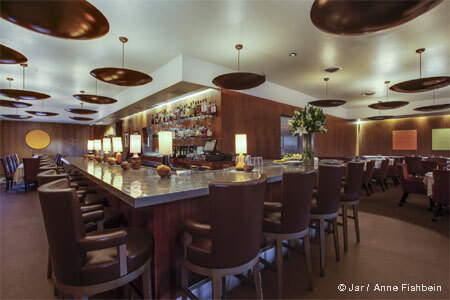 : This friendly Malibu eatery serves traditional dishes reminiscent of the Greek Isles. If it’s warm enough --- and it often is --- sit on the softly-lit, plant-lined patio. Otherwise, the spacious dining room is just fine, but more raucous. A couple of good starters are the slab of flaming saganaki cheese or the Corfu-style char-grilled baby octopus seasoned with olive oil, lemon and kalamata olives. Be sure to order a basket of fluffy pita to scoop up dips like a pleasantly salty taramasalata. If you’re craving meat, grilled lamb chops and chicken breast, brushed with garlic, oregano and lemon, should suffice. There’s also grilled quail over a bed of sautéed greens. “The Greek Feast” is the best way to sample Taverna Tony’s offerings, and it’s a bargain. Featuring a dozen plates at lunch and fifteen specialties at dinner, it includes several dips; tangy stuffed grape leaves; homemade lamb and veal sausages seasoned with orange peel; pastas; souvlaki; and roasted baby lamb. Try some homemade Greek sweets and a cup of very strong coffee to finish your meal.